Hurricane Maria was the most devastating hurricane to make land in Puerto Rico in nearly 100 years and the country is still reeling in its wake. Much of the island still doesn’t have running water, reliable communication or electricity. 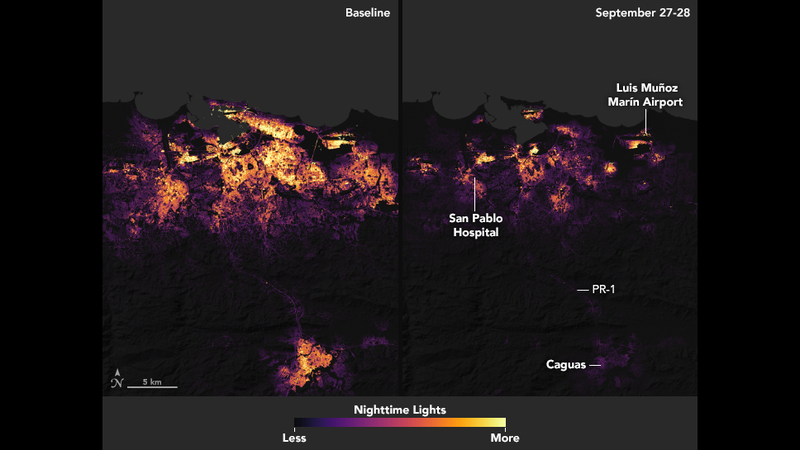 Recently, NASA published a set of date-processed photos that show the island’s nighttime lights both before and after the storm. Conversely, the following composite image is of data taken on the nights of Sept. 27 and 28—nearly a week after the storm hit—by the Visible Infrared Imaging Radiometer Suite, a scanning radiometer that collects visible and infrared imagery of land, atmosphere, cryosphere and oceans, according to NASA’s website. There are still pervasive power outages around the capital, including, NASA notes, at “key hospital and transportation infrastructure” locations. By releasing this information, NASA hopes to help emergency responders better map out which areas are still in need of help and who has been without power the longest.